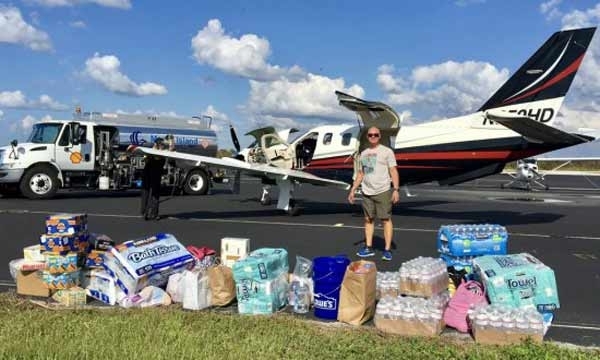 Daher on Friday recognized the TBM Owners and Pilots Association’s (TBMOPA) airlift of vital supplies to the Virgin Islands, Puerto Rico, and Houston following the devastation caused by recent hurricanes. Nine TBMOPA members brought their TBM aircraft to various locations in Florida for the pickup of relief supplies that ranged from food, water and chainsaws to generators, diapers and baby formula. The aircraft then flew to the Virgin Islands and Puerto Rico with average loads of critical supplies exceeding 1,000 lb. per trip. TBM owner John Ratliff, who also is a director of the Virgin Unite charity (www.virgin.com/unite/), said the private relief efforts with TBM aircraft were critical in providing such items as insulin and dialysis supplies to the right people at the right time. The “TBM Bridge” that airlifted supplies to the Virgin Islands and Puerto Rico helped ease the suffering of people in these areas, as have the efforts of owners of other general aviation aircraft, Radcliff said, noting there still is much to be done. He encourages owners with suitable general aviation aircraft to join the outreach, adding there is no lack of relief supplies – while a significant shortage of capable aircraft and pilots to transport the material does exist. Tom Gessler, another TBM owner, was impressed by the TBM group’s instantaneous impulse to do whatever was necessary to help. “We came together based on a personal and unselfish need to help fellow humans in despair,” Gessler stated. “We all pooled our resources to deal with each obstacle that came our way.” TBM owner Dr. David Pulver conducted an individual initiative – joined by another South Florida TBM owner, Arthur Steier, who served as copilot. Their mission was to bring supplies to San Juan, Puerto Rico, where the material would be unloaded for locally-based aircraft and ferry pilots. He praised all pilots involved in recent relief efforts: Phil Bozek (who participated in operation Airdrop after Hurricane Harvey in Houston); the “TBMOPA Bridge” group with Nigel Catterall, David Gasmore, Tom Gessler, Ken Malvey, Tim McCarthy, Dierk Reuter, John Ratliff, Paul Schubert, and Randy Thurman; along with the crew of David Pulver and Arthur Steier. “They have all done an outstanding job,” Chabbert said. “We are very proud to be associated with such fine people.” He added that the Daher parent company’s board has decided to recognize the pilots’ efforts by offering a fuel voucher to each of them.